In this course, Shaykh Walead Mosaad explains this key Sura of the Qur’an – a Sura the Prophet, blessings and peace be upon him, urged us to recite every Friday. 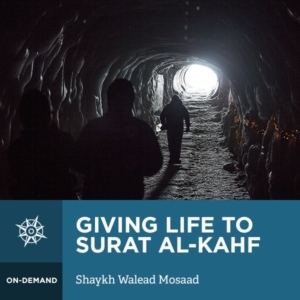 In eight videos Shaykh Walead explains the key lessons of Sura Kahf; the four great stories in it and the four great tests they represent – the tests of faith, wealth, knowledge, and power. Sura al-Kahf contains four allegories which contain many crucial lessons for us all. The story of the sleepers of the cave highlights the importance of belief in God, and the need to nurture it and keep it away from what harms it. The story of the owner of the gardens is one of gratitude to God. All blessings are purely from Him, and ignoring this – let alone denying it – makes one liable to losing these blessings. The story of Musa and al-Khadir is one of knowledge and humility. Musa humbled himself despite his high rank and great knowledge to learn more. The story of Dhul-Qarnayn is one of power. He was given dominion over much of the earth, yet he did not abuse his power. He used his power to bring about mercy on earth. Within these four stories, there are many lessons for believers. Shaykh Walead Mosaad shares his deep insights to beautifully give life to Sura al-Kahf.